The Eurasian patent is valid in Armenia, Azerbaijan, Belarus, Kazakhstan, Kyrgyzstan, Russia, Tajikistan and Turkmenistan. Fees associated with the Eurasian PCT regional phase entry as well as other patent fees are available in the fee calculator. The deadline for entering the Eurasian regional phase is 31 months from the priority date. The right to file the application may be restored in case failure to meet the deadline was unintentional and if the corresponding request is submitted and the corresponding fee is paid within 2 months from cease of the circumstances which prevented the applicant from filing or within 12 months from the deadline for Eurasian regional phase entry, whichever is earlier. 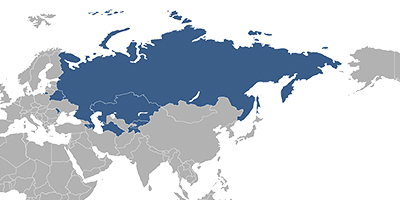 The language of patent registration in the Eurasian Patent Office is Russian. In case a PCT application is filed in any other foreign language the translation into Russian should be provided within two months from entering the Eurasian PCT regional phase. This term may be extended for two additional months provided that the corresponding official fee is paid. In case of entering the EAPO regional phase after a 31-month deadline, the fee for late filing of translation is required to be paid. Legalisation or notarization of a POA form is not required. It must be filed with the Eurasian Patent Office within two months from the date of entering the Eurasian PCT regional phase. The request for substantive examination must be filed simultaneously with entering the Eurasian PCT regional phase. This term may be restored for two months by paying extra fees. Disclosure of the information about the invention does not disprove its novelty if said disclosure was made by the inventor, applicant or a third party that directly or indirectly obtained the information from them and if it occurred within 6 months before the filing date or the priority date if priority is claimed. Official grant and publication fees must be paid within four months from issuance of the decision to grant a Eurasian patent. This term may be restored for two months by paying extra fees. The maintenance fees for granted patents are paid only to the Eurasian Patent Office (not in each designated country). The term for payment of annual fees differs from state to state. In Azerbaijan, Belarus, Kyrgyzstan, Russia, and Tajikistan annual maintenance fees are payable starting from the 3rd year of the Eurasian patent's validity. In Armenia, they are payable from the 2nd year. In Turkmenistan and Kazakhstan, they are payable from the 1st year. The appointment of an agent which must be a registered Eurasian patent attorney is required for foreigners. It's worth mentioning that a patent attorney must be registered before the Eurasian Patent Office, not before any local office of the EAPC member states. 1. Online Database for Eurasian Patents Search. 2. Entering the Eurasian regional phase of a PCT application as a utility model is not possible.